Spotlight on Kids - RightStart™ Mathematics by Activities for Learning, Inc. This page is dedicated to our RightStart™ kids. They are proud to say they got a RightStart™ in Math! If you have work or photos that you want to show to the world, send it in and we will get it posted for all to see. 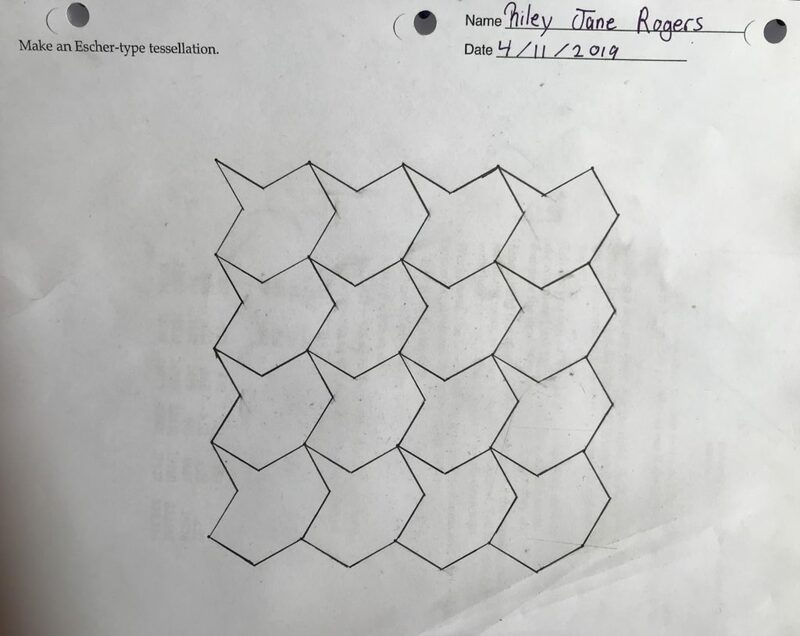 Look at what Riley did with her Escher-type tessellation. Nice work, Riley! We had a mom give us some great feedback about her daughter recently. She asked her daughter to count by 10’s to 200. She did fine up to 100 but was stuck after that so they pulled out the Place Value Cards to practice. After that her daughter did not want to stop! She went all the way to 1000. We received some great artwork from Qatar – Fiona’s child found a great use of what they are learning in Level B! Check out this awesome Halloween fractal! Andrew is loving the program, especially working with the Geometry Panels! Here’s a great Tessellation from RS2 Level G, by Jaya. Here are some drawings from one of our Level G students, Jaya, when working on rotations. Elana has been very creative with this wonderful piece of bead work. Notice the T-Square and triangle? Wonderful use of the Tessellation exercise in RS2 Level H. Look at the lovely pianos.